I love them. Here is a great article from awhile back. Few dead white male artists are as popular as Rossetti and co, despite a near total condemnation by modern critics. Even a senior curator at Tate Britain recently expressed to me his dislike of these artists - but what can Tate Britain do? As he said, if they don't show the pre-Raphaelites they get complaints from "teenage girls". 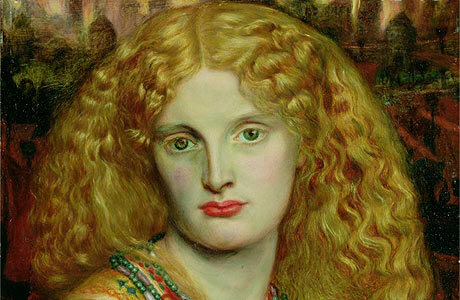 Well, I've decided to take my name off the petition calling for the pre-Raphaelites to be erased from history. After all, what was their crime? Not to be Manet. And yet just because their version of the avant-garde turned out to have little to do with the future of art doesn't mean these idealistic painters were without merit. They were very literary artists, in a literary nation. They told stories that moved and seduced their public - and still do. In the end, liking a picture because it reminds you of the imaginative worlds of Tennyson, Dante, Keats and Shakespeare - to take some authors the pre-Raphaelites illustrated - is commendable. There are far worse reasons to like art than because it feeds a passion for literature. It is not even true that modern art owes nothing to the pre-Raphaelites. Their fascination with poetry, romance and dream came into its own in the late 19th century when the Symbolists emulated, and deepened, their sensuality. There is a line from Burne-Jones to Gustave Moreau and Odilon Redon. This is why the pre-Raphaelites are famous all over the world, not just in Britain. We can't escape them, and we shouldn't deny them. They epitomise the worst of British art - and the best. 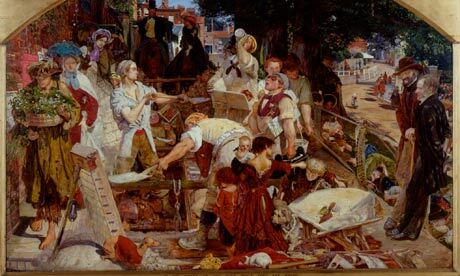 Hear the words "Ford Madox Brown" and "Manchester" in the same sentence, and you think automatically of the Town Hall murals, that 12-part picture book of the city's history which Brown was commissioned to paint on the interior walls of Alfred Waterhouse's neo-gothic civic palace in 1878. Here, in bold outlines and strong colours, looped around the magnificent Great Hall, you can trace the moment the Danes were expelled from the city in 920, or the day in 1761 the Duke of Bridgewater opened his eponymous canal, allowing coal from his mines to be delivered straight to the heart of "Cottonopolis". Look closely at the murals, though, and you'll see they have none of the grand swagger usually associated with Victorian public art. The Danes are keystone cops, tripping over each other as they quit the city, while the duke – a confirmed teetotaller – looks suspiciously excited and flushed. Surprisingly perhaps, these sly subversions are not the work of a young man. Brown was 72 when the paintings were finally finished in 1893 and they represent the summation of a five-decade career. Moreover, as this Autumn's Ford Madox Brown: Pre-Raphaelite Pioneer at Manchester Art Gallery reveals, such inspired mischievousness had been wound into Brown's work from the beginning. Starting with his first apprentice pieces in the late 1830s, he had been testing and tweaking the rules of established art practice in a way that frequently piqued his critics and still gives his admirers much to ponder today. 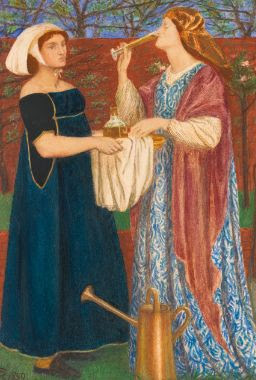 Brown's work has none of the hyper-loveliness of the pre-Raphaelites with whom his name is so often bracketed, even though he was never a formal member of the Brotherhood, that group of seven excitable young men who made a pact in 1848 to revolutionise English art by returning it to the purity of the 14th century. While Dante Gabriel Rossetti, John Everett Millais and William Holman Hunt rendered their historical, literary and mythological subjects with a metaphorical high varnish, Brown welcomed in the mess of every day. In his paintings hard noon light casts unflattering shadows on his sitters, who grimace and squint in protest. Colours clash, as they are apt to do in real life, while the children Brown loved to paint have the look of pudgy potatoes. Even his women are less than perfect. While technically Emma Hill, Brown's second wife and favourite model, was a working-class "stunner" chased from his studio into his bed, she departs from the bruised sensuality of Lizzie Siddal or Jane Morris in important ways. Instead of the rivers of hair and beestung lips there is a neat coif and an oddly shortened upper lip, which makes Mrs Brown look less like a medieval temptress and more like an amiable rodent. All this strangeness comes together in Brown's painting of 1851-9, Pretty Baa-Lambs. Ostensibly a picture of a woman in 18th-century dress holding a baby and petting some sheep, it is impossible to know quite what to make of it. The antique costume might suggest rococo pastoralism, something after Gainsborough perhaps. But Brown has added a sharp dose of the here and now. The painting was made entirely en plein air, all the better to capture the effects of a fierce midsummer sun. The woman's face is bright red, an English rose flaring unflatteringly in the heat, while the baby's sheeny arms look like over-stuffed sausages. Contemporaries were scarcely impressed – "a facetious experiment upon public intelligence" suggested one – and even now it is hard to decide whether it is, or is not, absolutely horrid. The main reason that Brown never joined the Pre-Raphaelite Brotherhood was that he was already embarked on a similar project. 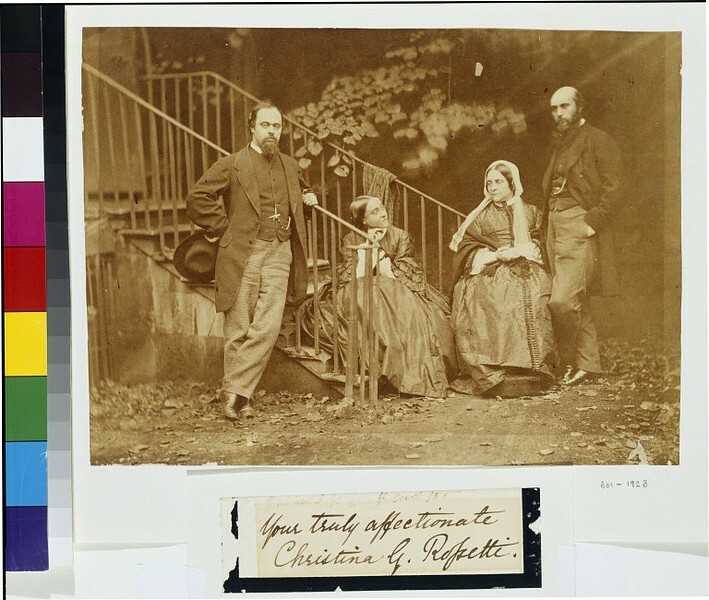 He was born in 1821, which made him a good seven years older than Rossetti, Hunt and Millais (Rossetti, indeed, had first made contact by asking whether Brown might take him on as a pupil). Brown's training had been different too. While the others had mostly come through the Royal Academy Schools, Calais-born Brown had attended the academies of Bruges, Ghent and Antwerp, where he had absorbed the realism and fine detail of the early Flemish and Dutch painters. His admiration for the sincerity and truthfulness of art made before the high Renaissance was further boosted by a trip to Italy in 1845, where he was able to see the great altarpieces and fresco cycles of Giotto and Fra Angelico at first hand. The subjects that Brown chose to paint were particular to him too. While the other pre-Raphaelites often lost themselves in a dreamscape of the distant or mythologised past, Brown's work was just as likely to crackle with the dilemmas of the present. In 1852 he started on his masterpiece, Work, a sprawling multi-figured composition which went someway to meeting Baudelaire's urgent demand that artists should take as their subject "the heroism of modern life". The scene is Heath Street in Hampstead, where navvies are digging up the road. Around and beyond them cluster sightseers and passers-by drawn from every level of society: a do-gooding lady with pamphlets, a man selling chickweed, some itinerant farm labourers, a scraggy little girl in charge of her younger siblings and, standing to the side, two middle-class men whom a contemporary viewer would easily spot as Thomas Carlyle and the Christian Socialist reformer, the Rev FD Maurice. The detail is inexhaustible and the purpose multiple. On one level the painting serves as a reminder that this newly urbanised society depends on a variety of labour that would have been unthinkable even 50 years earlier. But in its careful delineation of individual characters, the painting also suggests that every man and woman, of whatever social class, needs work as a kind of soul medicine. Or, to quote Carlyle, one of the "brainworkers" in the picture, "In Idleness alone is there perpetual despair." It wasn't just the subject of Work that was new. The painting dispenses with visual hierarchies, so that on first viewing it is not clear which are the most important figures. Incidents spread over the picture without ever quite coming into focus, which makes the eye skitter frantically over the picture plane. Each subsequent viewing reveals new clusters of characters, all absorbed in their own mini-dramas. Brown, wedded to the pleasures of narrative, wrote detailed backstories for each of his people: the pot boy, he explained, may well be wishing that leafleting do-gooder would listen to his opinion for a change, while the girl turned thuggish childminder is coping with an alcoholic father who will soon be up before the bench. In contrast to one of those big crowd scenes painted by William Powell Frith, the figures here push beyond their symbolic envelopes to become fully imagined men and women. The painting was remarkable too in the degree to which it was painted out of doors: Brown rigged up a trolley and wheeled the canvas every day into position. In this commitment to catching the exact play of summer light on a leafy street he anticipated the Impressionists by several decades. Meanwhile, the figures, modeled by friends, acquaintances and amenable members of the working class, were done in the studio where Brown agonised for weeks over such details as the potboy's fancy waistcoat. Even his pre-Raphaelite associates, known for taking pains, worried that Brown's "excessive elaboration" meant that Work would never be done. Painting en plein air, though, was not always possible. Brown's other great masterpiece, The Last of England, was conjured from his imagination or, as he put it, painted "as it would appear". The work concerns a young, shabby, middle-class couple setting out for a new life in Australia. The name of the boat – Eldorado – suggests that they are part of the southern hemisphere's short-lived gold rush of the 1850s. Their faces are blank and baffled by the scale of the step they are taking while their bodies radiate the pinched exhaustion of people who have no choice. The woman is based on Emma. The man is Brown himself, known in his youth as handsome, but here modelling the kind of sullen impotence you might see on a clever young man who has come down in the world. As ever, Brown lightens the whole effect with sly touches of humour: where you might expect to see lifebelts he has hung a row of scurvy-beating cabbages. Underpinning these two great paintings lay Brown's abiding interest in the underdog. Unlike his friend William Morris, he was never a systematic socialist, opting instead to make a series of pragmatic and personal interventions in the lives of the poor. He taught art at the Working's Mens' College and, later, set up the Labour Bureau in Manchester. In the same way, his art is one of engaged observation rather than noisy propaganda. Perhaps this was because, unlike the independently wealthy Morris, Brown understood poverty to be a complex, nuanced business. While never actually starving, he spent at least two decades of his working life harried by a lack of cash. The Last of England sold for less than it should, and Brown's hyper-sensitivity also meant that he tended to crash up against the institutions and people who would have done him most good. On one occasion, when John Ruskin, that great champion of the pre-Raphaelites, asked him why his recent An English Autumn Afternoon featured such an "ugly" view of Hampstead's rooftops, Brown flashed back sulkily "because it lay out of a back window". A difficult family life – his first wife died young, his second wife was an alcoholic, and he also lost his two beloved sons – hardly helped Brown to live in the strong sunshine that he so often chose to paint. That did not mean, though, that he plunged into sourness. Some of his most successful drawings and paintings are of children, whom he managed to capture without resorting to Millais's later kitsch (it is impossible to think of Brown making a painting like Bubbles). In his sketches of his own babies he shows them not as cherubs, but as snuffling young animals. Later, while living in Manchester and working on the Town Hall murals, he painted Madeline Scott, daughter of CP Scott, editor of the Manchester Guardian, sitting proudly astride her tricycle – the first time that such a contraption had ever been wheeled into a portrait painting. As this suggests, Brown found Britain's premier industrial city to be a conducive place to spend the last decade or his working life. Although he had no prior relationship with Manchester, its brisk, nonconformist atmosphere suited him particularly well. While reviewing the city's history to find subjects for his murals, he found an abundance of moments that chimed with his own subtle understanding of the human condition. The Trial of Wycliffe, AD 1377, for instance, suggests a profound sympathy with proto-Protestant Wycliffe's project of democratising ancient mysteries. Meanwhile in John Kay, Inventor of the Fly Shuttle, AD 1753, Brown shows us Kay fleeing from furious machine breakers, a wry reminder that what one man deems to be "progress" can also mean a downward tumble for countless others. In 19th–century England, a group of idealistic men and women dreamed of creating such an ideal world — spinning their bright, richly colored dreams against the drab, smoky background of the Industrial Revolution. Although they came from different walks of life and different artistic disciplines, today we know them collectively as The Pre-Raphaelites. Some years ago Steven Brust asked me to give a talk about Pre-Raphaelite art at the 4th Street Fantasy Convention, held annually in Minneapolis. He explained that he wanted me to speak not only about the history of this art, but why it is that one encounters so many Pre–Raphaelite fans among writers of fantasy fiction. This article is drawn from the 4th Street talk, and many conversations that followed it — about the lasting power of Pre–Raphaelite art to engage, enchant, and inspire modern writers and artists. For those unfamiliar with Pre–Raphaelitism, it is important to understand that this was not an artistic movement solely concerned with canvas and paint. It was a movement of artists whose paintings and designs were thoroughly entwined with stories: with ancient myths and medieval romance, with 18th– and 19th–century poetry, with the great heroic epics of the past and humble folk tales from the fireside. (Two of the most important artists of the movement — Rossetti and Morris — were equally famed as writers.) Furthermore, these artists were positively revolutionary in Victorian times for bringing their rich aesthetic ideals out of the painting galleries and into every aspect of daily life — from the clothes one wore, to the chairs one sat on, to the gorgeous hand–bound books from which one read Chaucer and Malory. It is this aesthetic, along with the paintings and prose, that has survived for over one hundred years, as compelling to some of us today as it was during Queen Victoria's reign. I sit here now at my desk in a 16th–century English cottage with Morris patterns on the wallpaper, the curtains, and the cloth of my skirt; with Burne–Jones prints framed on the walls and Kelmscott facsimile editions on the shelves . . .hence I must plead guilty to a certain Pre–Raphaelite obsession. But let me quickly point out that it's one that I share with many others in the fantasy field: Thomas Canty, Brian and Wendy Froud, Alan Lee, Charles Vess, Michael Moorcock, Elizabeth Hand, Emma Bull, Jane Yolen, Lisa Goldstein, Robert Holdstock, and Delia Sherman, to name just a few. It seems that those of us drawn to this art are often drawn as well to its encompassing vision: the idea that art is not just something to look at, or to find in a book, but that art is (or can be) a way life — a religion of Beauty, of Romanticism, that surrounds one (as Yeats would say) right down to the tiles round the chimney piece. The Pre–Raphaelite movement was officially begun in the middle of the last century by seven young artists, barely into their twenties at the time. Painting, as it was taught back then (at London's Royal Academy), was bound by a strict series of rules, formulas, and conventions which determined what these artists could paint and exactly how they could paint it. Dante Gabriel Rossetti, William Holman Hunt and John Millais were at the core of this group of friends who defied the art establishment by exhibiting subversive, scandalous paintings signed with the mysterious letters "PRB". The initials stood for the group's nom de guerre: the Pre–Raphaelite Brotherhood. They chose this name because they worshipped early Italian and Flemish art — the art before Raphael. The Brotherhood never set out to mimic the style of this early art, but rather they sought to evoke a similar spirit of freedom and simplicity: primarily by the radical concepts of painting directly from nature, out–of–doors; and by painting with bright, translucent colors straight onto a white background (rather than with the subdued Academy palette, painted light on dark). This hardly seems radical to us today, but when the group began to exhibit such work, the paintings deeply appalled Academy officials and the viewing public. Looking at these paintings today, what we see are quaintly historic images dripping with romanticism — but what viewers saw a century ago was something rather different. To them, the colors were of a shocking and vulgar brightness, rather like hanging Peter Max posters on the gallery walls. (The colors have since faded with age; we can only imagine their impact now.) Furthermore, the Brotherhood ignored the prescribed list of respectable Academic subjects; instead, they painted images drawn from Celtic legends and English folklore; from Romantic poets like Shelley and Keats and modern writers like Tennyson — or else they treated traditional subjects in shockingly untraditional ways. Millais' luminous painting of Christ's childhood, for instance, horrified Victorian viewers because it placed a barefoot Christ–child in a common carpenter's workshop. The following review from the London Times was typical of the notice they received: "We cannot censor at present as amply or as strongly as we desire to do that strange disorder of the mind or eyes that continues to rage with unabated absurdity among a class of juvenile artists who style themselves the PRB. These young artists have unfortunately become notorious by addicting themselves to an antiquated style and an affected simplicity in painting which is to genuine art what the medieval ballads and designs in Punch are to Chaucer." Though taken aback by the fury of these attacks, the Brotherhood then received a stroke of luck. The influential critic John Ruskin, who admired the young painters' fidelity to nature, wrote to the Times in their defense, concluding that "with all their faults, their pictures are since Turner's death the best, the incomparably best, on the walls of the Royal Academy." Now the tide began to turn. With John Ruskin's invaluable (and often meddlesome) patronage, the Pre–Raphaelite style of painting proceeded to change Victorian ideas about art and to buck the old establishment. Over time, these artists grew famous, wealthy, and became the art establishment against which the next generation of students (the Modernists) would rebel.